Andres has a range of passions, and is grateful to be able to pursue his educational interests at Georgetown University, where he is majoring in Economics and minoring in Psychology and Business administration. He additionally is a member of the Georgetown Men’s Soccer club, which enables him to connect with a new community of people. As an undocumented child immigrant from Mexico, separated from his parents for many years, Andres was reunited with his parents in Virginia at age 11, and for most of his young life, he has faced and overcome many stresses and challenges. For years after his arrival in the United States, he wondered if having personal educational goals was pointless, fearing he would be forced to end his education due to his legal status. Only after joining the Emerging Leaders program, designed to enable aspiring leaders to improve their writing, interview and public speaking skills, did he learn that not all colleges disregard undocumented students as potential applicants. This experience changed Andres’s vision for his future forever. One of Andres’ proudest achievements has been becoming a fluent English speaker in only two years. This fluency enables him to demonstrate his potential as a learner, express himself, and feel confident about his learning abilities. Becoming bilingual has opened new doors for his future. This achievement embodies what he values as fundamental to his education: discipline, initiative, resilience, and commitment, as well as learning from his own mistakes and from others. It exemplifies his endeavor to thrive in a diverse society and reflects his motto that nothing profitable comes without arduous effort. Learning a new language corresponds to his willingness to merge into a new culture, pursue excellence, and overcome obstacles. This achievement represents a milestone in his education and defines the strong-willed individual that he has become. Through his mentoring of other young immigrant children, he strives to instill in children an understanding of the life-changing power of education. A current challenge that he finds daunting, however, is how to pursue and finance a college education. He is grateful for the assistance of the Dream Project, through which he learned that, even as an undocumented immigrant, he is eligible to apply for college. 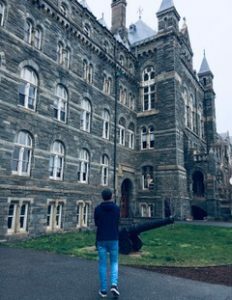 He relies heavily on scholarships from Georgetown University, as well as financial aid, to finance his education, but is acutely aware that financial aid is tenuous and requires annual re-applications, with no guarantee of being granted. Andres’ vision for his future is to become an Economist who focuses on clients’ social context to further understand the reasoning behind their economic behavior. In doing so, he would be able to combine his passion in economics and psychology to continue to facilitate the success of others.